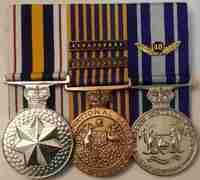 Police related medals, awards and collectables- UK, Colonial & Commonwealth. Possible Norwich Police Royal Visit Medal?? 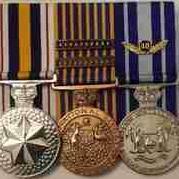 Police Long Service Medal variations? Hi all- I have had a closer look at my obverses- in particular the QEII DEI GRATIA. The cupro-nickel Queens head is slightly more vertically placed on the disc than the Rhodium plated one. The rhodium plate head is tilted just a little towards the left- so that the cross on top of the rhodium crown point towards the end of the claw footing. The cupro-nickel cross points more towards the centre of claw fitting. Amazing what you see when you really look closely! Thanks Deelibob, always helps having eyes on the ground- especially from 12,000Km away! Can anyone assist me with information about a silver coloured medal issued to Macclesfield Special Constables for World War 1 service. I have attached Obv and Rev pictures for information. Cannot find any references about it after numerous searches! I hope you can help! I have an 1897 C of L Police jubilee medal to PC 404 W. SHEEN. I am trying to locate anything on his history with C of L police and hope you can assist. It's a little difficult to source info from Australia! Go on the ''London Metropolitan Archives'' site and give them all his City of London Police details, as you have listed above, asking if his personal file is available. They will then tell you if the file has survived and they will sent you some forms which allows you to pay a small charge for them to go into the file and give you a break-down of the costs of supplying a copy of the file. If he has a big file, it might be a bit costly so you might only want the best bits from the file. I live in Scotland so I have to do the same and all communications with them is by 'e' mail and post so being in Australia will be no problem for them. The files obviously contains lots of details you can't get anywhere else and are invaluable if you want to research this individual. Also go on the ''Old Bailey trials'' site.... basically put in PC Sheen or Sheen and see what comes up around the period you think he was in the City of London Police. Is the reprinted book 'The Metropolitan Police, The Men and Their Medals' still available? If so I would like to purchase one! The book is still available but I see you live in Australia - I have just checked the cost of postage and other than sea mail which takes ages, the cost is around £19 for untracked postage as it is a heavy book and weighs over 1.7 kg when packed. This almost doubles the price of the book which is now £22. Also I'm not sure if they would hit you with customs duty as well. By comparison the cost to send it second class within the UK is just £3. Because the postage for overseas mail has gone up so much I haven't sold any abroad for several years. I have tried to convert it to an e-book but failed I'm afraid. I do have it in pdf format which I can e-mail out but I am a bit wary of doing that as it is possible to start a print run from that. I have sent one copy to Canada on the understanding it was for the personal use of the recipient only. It is annoying as I have about sixty copies of the book and most of the interest I seem to get now comes from abroad! Thanks, Bigjarofwasps. I will have a go!